The turnout (har har) was rather decent. Go San Francisco balletomanes! I was expecting be one of only a handful of people in the theater, but by the time I strolled in (not with popcorn but with coffee–this was Sunday at noon after all) at ten minutes before showtime, to get to an easily accessible center seat I had to sit in front of the cross aisle, closer to the screen than I usually like, but it turned out fine. The ballet or the movies? It’s both! I won’t go into a full review of the performance but I will say that I enjoyed virtually every moment. La Fille is so exuberant (spoiler alert: no one dies! ), and the leads, Steven McRae and Roberta Marquez, were exquisite as the young lovers. This filmed format, with all its close-ups, points out the additional acting demands, and Marquez especially was up to the task. I even shed a few tears during their ribbon pas de deux, it was so lovely and full of emotion. And yet again in the second act I found myself welling up a couple of times. Ah, love! Back to the nuts and bolts: Before the performance and during intermission, there were a few behind-the-scenes featurettes. I thought they were really great in putting La Fille in context. 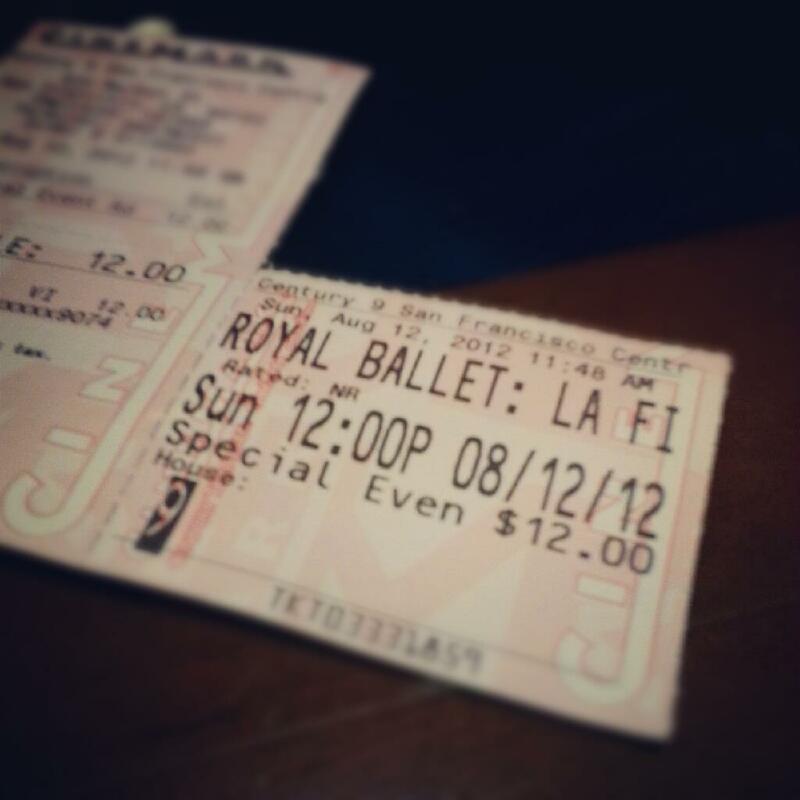 This was my first “ballet at the movies” (I have been to a few outdoor opera simulcasts), and I think I’m hooked! It was part of the Ballet in Cinema summer rebroadcasts of live performances from earlier this year. The final ballet, Raymonda performed by the Bolshoi, will be shown at several Cinemark (Century, Cinéarts) movie theaters on Sunday and Tuesday, August 26 and 28. » See also fellow ballet blogger Steve (of You Dance Funny)’s blog post and review: “How adorable are Roberta Marquez and Steven McRae? I loved them both tremendously in the roles of Lise and Colas, and found their chemistry quite endearing.” Yes!